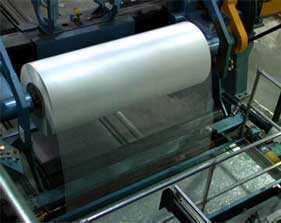 Raven manufactures reinforced polyethylene and polypropylene materials by laminating two sheets of plastic film or sheeting with a third layer of scrim reinforcement bonded together with a fourth layer of hot molten resin. The process in done under precise pressure and controlled temperature to assure long-term product performance. This versatile extrusion lamination process provides our customers with a wide range of durable, high-strength reinforced materials for industrial applications, weather protection in the construction industry, environmental and decorative geomembrane liners, rugged outdoor covers, moisture and gas barriers and many other innovative products. 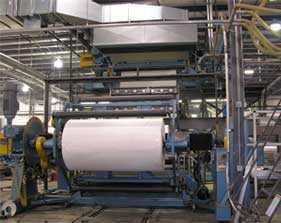 Our lamination capabilities include a variety of fiber reinforcements and outer lamination plies formulated in our extrusion facility to meet your specific requirements. 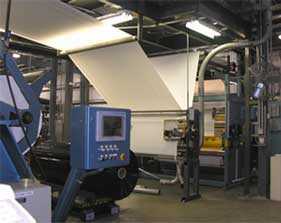 Raven is capable of coating and laminating films from 3 mil up to 45 mil thick, depending on particular specifications. We encourage you to contact us to discuss your next requirement. Raven will work closely with you to design a tailored solution as we have for hundreds of our long-term repeat customers.